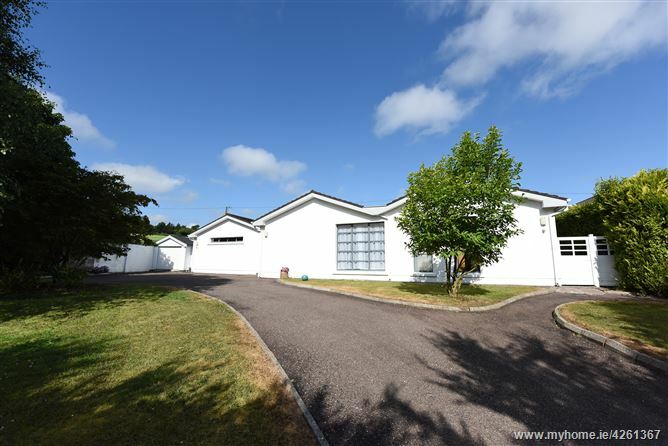 This is a deceptively spacious architecturally designed bungalow which is situated on a lovely site with a South West facing rear garden. The property is in excellent condition throughout and is a credit to its current owners with a host of quality extras. Accommodation consists of Entrance Hallway, Large Living Room, Spacious Open Plan Kitchen/Dining/ Lounge Area, 4 Double Bedrooms, 3 Ensuites, Family Bathroom and a Utility Room. This property would be ideally suited as an upgrader family home with generous living space on a private site. Viewing is highly recommended!! The Gables is situated in this most convenient and extremely accessible location close to all essential amenities. The Gables is within easy reach of the Cork City Centre, CIT, CUH and Wilton Shopping Centre just to name a few. This location provides easy access to the South Link road network (N40) which provides arterial access to the city centre and to the N25/ M7 corridors. A timber front door leads to a spacious, light filled hallway with travertine tiled flooring. Velux windows overhead allow ample light to enter the hallway. Bright and spacious living room which is beautifully situated at the rear of the property with a south-west orientation. This room benefits from a large stove, solid oak timber flooring and a sliding patio door which leads directly to patio area and garden. This room is a large open plan area. The dining room area can comfortably facilitate a table and 6 to 8 chairs. The dining room leads to the lounge area which benefits from a stove and a large window overlooking the rear garden. The kitchen area has a range of floor and wall level, high quality units and fully tiled flooring. The kitchen ceiling is raised with Velux windows leaving ample lighting in throughout the day. Double French doors lead to the rear garden and patio area. This utility has a range of floor and wall level units, a double drainer stainless steel fitted sink and a door which leads to the side. This is a beautifully finished master bedroom suite with a raised ceiling, solid oak timber flooring, two radiators, a range of lights and one window overlooking the front of the property. French style patio doors lead to the rear patio area. This room benefits from a walk-in wardrobe with ample hanging and shelving space. This is a three piece suite incorporating power showers with jets, wash hand basin & WC, heated towel rail. The floors and walls are both fully tiled with one Velux window overhead and one frosted window overlooking side. This room benefits from a range of built-in wardrobe units with ample hanging and shelving. There is oak timber flooring with one window overlooking the side of the property. Shower unit, wash hand basin, WC and one Velux window. The floors and walls are both fully tiled. This is a bright & spacious room, solid oak timber flooring, built-in wardrobe units, one window overlooking side and one window overlooking front. Large ensuite with corner shower unit, wash hand basin & WC and a heated towel rail. The floors and walls are both fully tiled and one frosted window overlooking front. This is a beautiful bright bedroom with a large window overlooking the front of the property, oak timber flooring. This is a luxurious three piece bathroom suite incorporating Jacuzzi style bath, wash hand basin & WC. The floors and walls are both fully tiled, heated towel rail, mirrored Sliderobes ideal for storage. Also includes hot-press area with ample shelving and one light. To the front this property is approached via a tree filled road and accessed by electric gates. The driveway & parking area are fully laid to tarmac. The garden areas to the front are laid to lawn with beautiful array of mature trees & shrubs. Very Private. Side gates lead to the rear of the property. Garage/Shed, ideal for a mini workshop and storage etc. The rear of the property is mostly maintenance free, it’s laid out with lovely patio areas and mature trees, plants & shrubs. This is a very private garden which is not overlooked and with its South Westerly aspect its ideal for Summer entertaining & barbeques.